LEGO Technic kits are a great (and somewhat educational) way for any car enthusiast to kill some time. These kits are for advanced, experienced LEGO builders and usually feature intricate details and moving parts. The line has all sorts of real-world vehicles for LEGO fans to make, including a Porsche 911 GT3 RS, a 911 RSR, a Bugatti Chrion and industrial vehicles like cranes, trucks, planes, helicopters, boats and more. The latest addition to the LEGO Technic line will be of very high interest to readers of this site, we think. 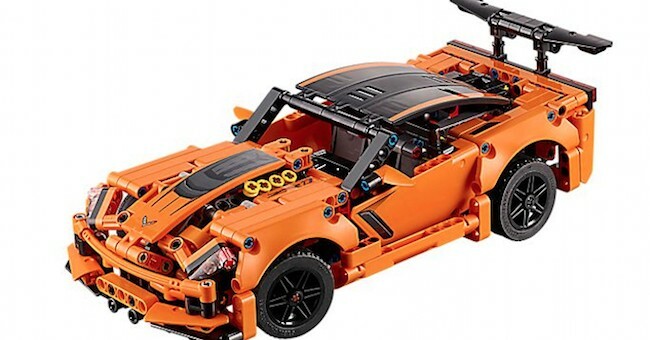 The creative minds over at LEGO have teamed up with General Motors to introduce a new C7 Chevrolet Corvette ZR1 Technic kit. The company says the Corvette ZR1 kit “really captures the essence of the iconic supercar and comes with an authentic orange and black color scheme, black spoked rims with low-profile tires, large rear wing and 4 tailpipes.” It also features working steering and a visible detailed V8 engine with moving pistons. It’s may not be making 755 hp like the Corvette ZR1’s insane 6.2-liter supercharged LT5 V8, but hey, you can’t always get what you want. When completed, this kit will measure 3 inches (8cm) high, 11 inches (29cm) long and 4 inches (12cm) wide. Additionally, it’s a 2-1 set and can also be rebuilt into a hot rod-style car packing the GM V8 under its hood. It’s like the reversible sweater of LEGO kits! 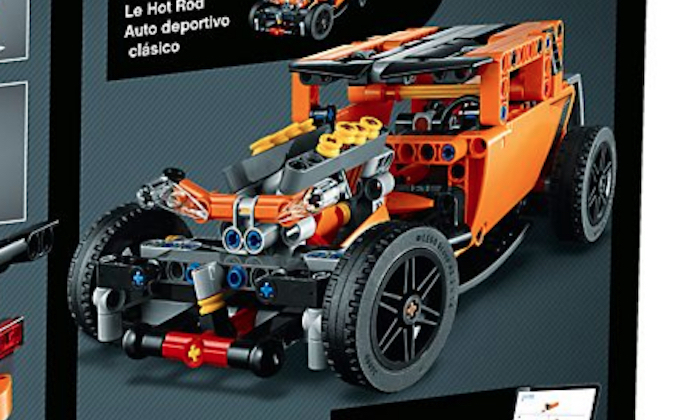 One interesting aspect of this Corvette ZR1 LEGO Technic kit is the rear lights. It’s hard to remake the trapezoidal C7 Corvette taillights with LEGO, so the company opted for some rectangular taillights that look a bit out of place. We must say, though, the kit looks to be fairly accurate to the real world Corvette ZR1 – especially when you consider the limitations that LEGO pieces present. The kit retails for $49.99. I doubt this kit is just $49.99. I’m willing to bet it’s actually $249.99. But, this looks actually amazing and is what I’ve been wanting ever since I saw the Porsche 911 kit a few years back. EDIT – I stand corrected. It really is just $50. Looks like the model is not the same scale as the Porsche 911 model, which is a little disappointing, but this still looks amazing! That kind of money will get you a BBR 1/18 2014 Le Mans Vette model. Hmmmmm, Drooooool…. They have a wide range of price and detail on the Technic kits. This one is pretty basic. My son is building the Bugatti now and it is pretty impressive from the functioning W16 to the awd with gear box and differentials that function down to the pinion gears. The 911 is disappointing compared to the Bugatti. How about a late round of awards, this time for Automotive Journals and Jounalism? You writers need something like a Grammy/Oscar/Emmy or Pulitzer for the excellent work you do that informs and entertains us every day. How about something like the “Phil Hill award for driving fast and telling it like it is!” Cheers and thanks! Congratulations to everyone at GMAuthority, y’all deserve Hill Awards and I’m sure you have won / will win many deserved awards over the years. Every day you build the best place to go for car enthusiasts. Cheers! Thanks! Trophies! Thanks Trombone and thanks for reading! Much appreciate the nice comment, have a Happy New Year.